Better late than never! 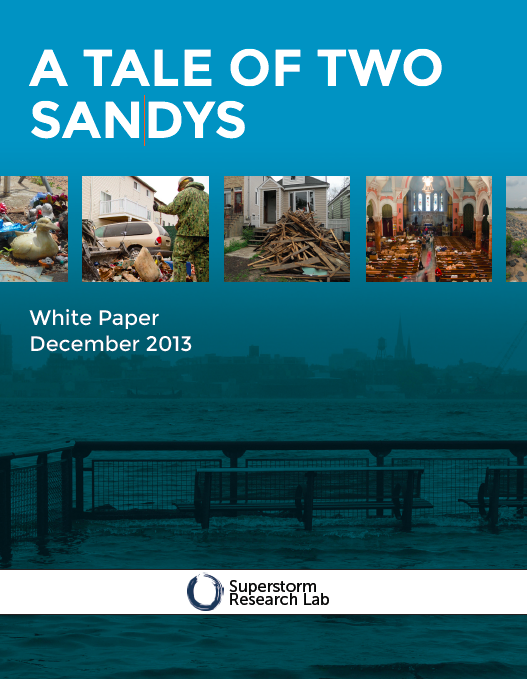 The research group on Sandy’s aftermath that I work with, Superstorm Research Lab, released this report months ago. This was produced by a non-hierarchical, mutual aid group of scholars, primarily PhD students, and one then-post-doc. I’m pretty proud of what we accomplished, and our group is still buzzing with ongoing and new projects. A couple of us are now working on a shorter piece that summarizes, develops, and extends the report’s findings. And I’m completing an academic article on the pretty un-noticed revolution in the city’s climate politics that occurred after the storm. More on these soon. Meanwhile, for the record, below is the text of our initial release. You can download the whole report here. Responses to Hurricane Sandy consistently cluster into two types according to how the issues have been defined and understood. On one hand, the crisis was seen as an extreme weather event that created physical and economic damage, and temporarily moved New York City away from its status quo. On the other hand, Hurricane Sandy exacerbated crises which existed before the storm, including poverty, lack of affordable housing, precarious or low employment, and unequal access to resources generally. A Tale of Two Sandys describes these two understandings of disaster and discuss their implications for response, recovery, and justice in New York City. The white paper is based on 74 interviews with policymakers, environmental groups, volunteer first responders, and residents affected by the storm; ethnographic observation; analysis of public reports from government, community-based organizations, and other groups; qualitative analysis of canvassing forms and data; and a review of the academic literature on disaster response. As a framing document, A Tale of Two Sandys selects certain case studies for their exemplary nature, including how different groups identified vulnerable populations, timelines for aid and recovery, a case study of housing and rebuilding, and finally, urban climate change politics. The primary purpose of A Take of Two Sandys is to propose a sophisticated, accurate, and useful way of understanding the inequalities entwined with Sandy’s aftermath and to enable ways to address them. I’m going to updating the blog more often now. But I wanted to recap a couple important bits that happened during my hiatus.